StrongVPN started out as a small company that sold PC computers in 1994. Since then they have expanded into a global VPN Service Provider that has attracted many loyal users from all around the world. The years of experience they have had in the industry has enabled them to put their ideas into action. The for example they have implemented a feature that monitors the performance of all their servers so slow server speeds is never an issue at StrongVPN. They have published this server list on their websites that informs you of how many user accounts are available on any particular server at any given time. So you can bet they are on top of any issues. 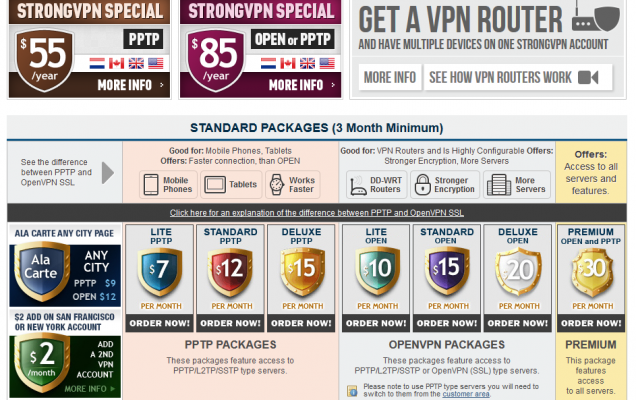 StrongVPN gives you the ability to customize your package and the pricing. Choosing from a variety of packages allows you to receive the most suitable and optimal service at a fair price. There are seven different packages for a customer to choose from, a feature that is quite unique. The only drawback is that international servers can be accessed only through the Premium and Deluxe plans. None of the plans offer unlimited server switches, a benefit that you can enjoy only at an extra fee. The minimum subscription duration is for 3 months. The total flexibility based on intended purpose and budget is however, worth checking out. They don't offer a free trial but they offer you a 7 day 100% guarantee.If you aren't satisfied with their service they will refund your payment. That sounds totally fair. StrongVPN has an impressive range of options from which you can make payments. Their payment options include Paypal, Bitcoin, Visa, Master, Amex, Wire Transfer, Western union and Discover among others. StrongVPN has more than 486 servers spread throughout 22 countries all over the world and are continuously adding servers. You are given a choice of either a Static or Dynamic IP depending on your requirements. You can also purchase a Strong DNS Package for $5 per month ,they also offer a 7 day free trial. They provide you with a list of supported sites. It supports all possible devices and their tech support is available 24/7 if you need assistance. In need of a router? If you want to share your VPN connection with multiple devices it is a good idea to purchase one. You can purchase a preconfigured router or configure it on your own, it is your choice. They have made it so flexible and easy. Make sure you purchase an account with them first to verify their service has the speeds etc that you need. The software for StrongVPN is compatible with most of available platforms and operating systems. It works for hand held devices such as mobile phones and tablets, as well as computers. Android, Windows, Linux and Mac are some of the operating systems supported. The quality of support offered by StrongVPN is simply amazing. Support is offered through emails and Skype as well as through a live chat on their website that functions 24/7. Teamviewer is also used to offer remote assistance from wherever you may be. Most of the servers are configured for SSTP, L2TP and PPTP protocols, with the rest of the servers adding OpenVPN to the list of protocols offered. StrongVPN is one of the oldest and experienced VPN providers so you can be assured that they will continue building a quality and reliable service. StrongVPN is definitely a good choice.